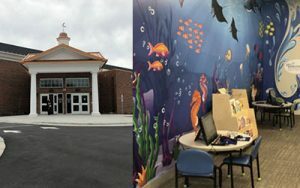 After having been open for two months at its new location, the Kernersville Library has seen significant growth and is one of the busiest in Forsyth County. Going from a space that was 5,000 – 7,000 square feet to a building that is 20,000 square feet, Stephanie Kellum, youth services librarian, said they are now significantly larger and have many new additions. Kellum said they have two small rooms, a conference room that seats six – 12 people and an auditorium that can hold 100 – 150 people. “This is the first time we’ve had a really big auditorium,” she stated. She added that the small rooms and conference room are great for tutoring and for businesses who need a conference space for meetings or training. Kellum said you can book the conference room on their website for free, but the meetings cannot be for a private event. “We also have a nice courtyard outside, which will be nice to use for story time when it starts to get warm,” she said, adding that there are outlets available outside for people to plug their computers into. Kellum said they have seen an increase in the number of people and families attending story time, as well as people walking through the door each day. Included in their additional, Kellum noted that they have a Children’s Room, which is ocean themed and features a large mural on the wall. There are also sensory toys on several of the bookshelves as you walk in for young children to play with. Other things that are new include a play kitchen, a reading nook for kids to climb in for a private, comfortable place to read, and technology. Kellum noted that they have a new story time room, which they didn’t have before. When they were in their previous location, they had to borrow space from the Senior Center. With the addition of this room, Kellum said they have been able to open up Lego Storytime to more people. “This is held on the first Tuesday night of each month at 6 p.m. and is for ages 2 – 5. It’s designed around kindergarten readiness, so we read a book, sing a song and build something on that theme, and then we talk about what they built and read,” she explained. Kellum said they now have a space just for teens, called the Teen Zone. In the Teen Zone, there are four internet computers that can be used for homework, one gaming computer that has been very popular, and an all teen collection of books, magazines, graphic novels and movies. “We have two gaming areas for teens and will be getting some video games for them to play, which are very similar to the ones at Central Library,” she said. Crystal Holland, branch manager for the Kernersville Library, explained that, in total, they have 20 computers, when they previously only had eight. “That doesn’t include our catalog computers and the two self-checkout computers, which are wildly popular,” she said. In the adult area, they doubled their soft, comfortable seating and added two coffee tables. Holland shared that with the move to their new location, the Forsyth County Board of Commissioners approved for them to have one more full-time staff member. The new staff member is Library Assistant Diarra Leggett. Holland added that Leggett is very creative with programming and coordinates the art wall, which currently features local artists from the Water Color Group out of the Senior Center. Kellum said they have a Maker Space area, which is used for all programs and open craft times. “We have crafting supplies for people to use in this area, and we will be adding a 3-D printer and two sewing machines for people to use,” she said. Holland said with the Maker Space, they also have more opportunities for volunteers to help. “Library Assistant Melissa Lavely is working with this and coordinates the volunteers since we have opened,” she said. Along with the additional space inside, Kellum noted that outside, they have additional parking for the library. “We also have a drive-up book drop, so you don’t have to get out of your car,” Holland said. Holland added that they now are also open seven days a week. “We are now open on Sundays from 1 – 5 p.m.,” she said. The Kernersville Library is located at 248 Harmon Ln. For more information, call 336-703-2930 or visit www.forsyth.cc/library/kernersville. 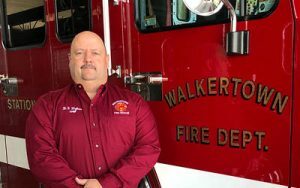 After the retirement of longtime serving Fire Chief Wesley Hutchins, Daren Ziglar was voted in as the new chief for the Walkertown Fire Department. Ziglar first joined the WFD in 1984 at the age of 14 as a cadet. He was also the first in his family to go into fire service. Not long after that, his family joined him. He explained that in 1989, after his father retired from AT&T, he joined as an EMT. Later, his mom and wife became involved in the Ladies Auxiliary, and now his son David is a captain with the department. After volunteering as a firefighter with the WFD, Ziglar was promoted and served as a lieutenant for eight years in the 1990s, 12 years as a captain and three years as the assistant chief. Ziglar said the WFD has had good, steady leadership since the department started in 1953. “There have only been seven chiefs, and now eight, and only three chiefs since 1989,” he said. Ziglar was drawn to the fire service after several men in the fire service from his church pushed him toward the field. “I became a paramedic for the county, which I did for 30 years until I retired in 2018 as the assistant chief of Emergency Services,” he said, noting that he volunteered for the WFD during this time and is now part of the Life Star Emergency Services. Ziglar said his most proud moment with the WFD is that his whole family has been involved. As chief, Ziglar said he has a lot of people depending on him and it’s his job to make sure they go home at the end of the day. In his new role, Ziglar said he hopes to get more involved with the community and grow the department’s membership. He noted that since he started in January, they have taken in eight new members, six of which have been junior firefighters who are part of the Walkertown High School’s Fire Academy. Ziglar explained that the fire department has an age gap. In order to be a firefighter, Ziglar said they have to put in 36 hours a year minimum, even for the volunteers. Making their day room more comfortable is something else Ziglar said they are doing to help make things more comfortable for the firefighters at the WFD. Ziglar shared what he enjoys about the fire service. Ziglar said there are three things that make a department successful: staff, calls, and the structure and support that bring it all together. In total, the WFD has 53 members, which include paid and volunteer members, as well as officers and EMTs. Ziglar encourages anyone who is interested in becoming a member to call the department or stop by to see what is involved and if it is something they would like to pursue. “It’s a great way to look into a new career, and we take members as young as 14,” he said. For more information about the WFD or to see information about public education and updates, visit them on Facebook, www.facebook.com/WalkertownFire, and Twitter. 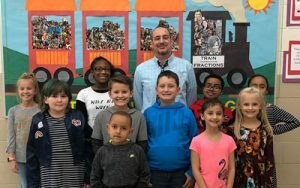 Sweet, humbling and heartfelt were some of the words David Russell, art teacher for Walkertown Elementary School, used to describe about how he felt when he learned he had been named the school’s Teacher of the Year. Russell grew up in Kernersville and graduated from East Forsyth High School in 1987. After graduating from the University of North Carolina at Greensboro, he found his first teaching position in East Bend, traveling around to various schools throughout the week for 17 years. Russell added that the assistant principal’s mother was his science teacher when he attended middle school at what is now known as Glenn High School, he went to school with the librarian at the school, and the PE teacher’s husband lived in his neighborhood when he was a kid. Russell said that while he had an influential teacher that steered him toward art, he chose to become a teacher because he likes kids. He said one of his college instructors, Chip Holton, was influential in helping him decide to go into art. “He was a great instructor and he had a great time teaching art,” he stated. Along with teaching students in his classroom, Russell said he helps with third through fifth grade drop off in the mornings, watches students after school, is the specialist representative for the PTA, is in charge of the school’s sign at the front of the building, and helps with landscaping in the summer. As a teacher, Russell said he likes to be hands-on and tries to make art fun, while letting students work at their own pace. “I like to think about what I like to do at that age since I am internally 12,” he laughed. What Russell said he likes most about being a teacher is the kids. “I like to see when they have learned something new, and I like being a guide to their creativity,” he stated. Russell said the students do a lot of different things in his class, such as painting by blowing paint through straws, using yarn, folding origami, zentangles (making repetitive designs inside of their initials) with fifth graders, and more. Russell said a lot of funny things have happened to him as a teacher, from falling out of his chair and being taped to a wall, to having pies thrown in his face, being hit with water balloons, and wearing a dress to a beauty pageant fundraiser. When his students look back on having him as a teacher, Russell said he hopes they remember that he always had a smile on his face. “I also hope they remember that being creative is fun and that trying to help others is very rewarding,” he shared. When he isn’t teaching art, Russell enjoys spending time with his family and being creative. When he learned that he had been named WES Teacher of the Year, he was humbled. Give lifesaving blood donations during the Joel McClain Memorial Blood Drive, which will be held at Grace Presbyterian Church on Saturday, February 23 from 9 a.m. – 1:30 p.m. The McClain family started the Joel McClain Memorial Blood Drive in 2012 after their son passed away at the age of 4 ½.
Joel McClain was born July 7, 2006 with Congenital Disorders of Glycosylation (CDG), a very rare genetic disorder that stressed his major organs and caused both physical and mental delays. According to www.cdgcare.com, Glycosylation is the process of adding sugar building blocks (also called glycans) to proteins. Even though glycans are made of many sugars, this is not related to blood sugar levels or diabetes. People with CDG have health concerns because their bodies cannot properly add sugar building blocks to proteins. Every part of the body requires Glycosylation to work normally, which explains the many different health problems that affect people with CDG. Brea explained that her nephew is doing well. “He is 15 now and doing really well,” she said. She explained that they knew something wasn’t right pretty early on as Joel was smaller at birth than any of the other children and had really long fingers, toes and larger ears. He was also having a really difficult time gaining weight. It was after they were referred to a geneticist when Joel was six-weeks-old that they learned Joel had the rare genetic disease. Brea shared in an earlier interview that they had to change Joel’s diet because of this, and while he began gaining weight, there were other challenges Joel faced throughout his life, including an intense gag reflex and trouble chewing and swallowing food for almost a year, among others. She said Joel had to consume high calorie meals because his metabolism was about three times as fast as the average person. Brea noted that there are 14 sub-types of CDG and the one Joel had affected him both physically and mentally. Despite the hardships Joel struggled through, Brea said it was hard to find him without a smile on his face, and he always wanted to be right in the middle of what his siblings were doing. Joel even had the chance to meet his little brother. She explained that when Joel went into the hospital for the last time in January 2012, she had just given birth to their sixth child, Corwin. Brea said Joel’s chances for survival were slim from the start, but he was blessed with good health until his fourth year of life when he got pneumonia and his liver began to fail. Brea explained that they started the Joel McClain Memorial Blood Drive because of all the blood products Joel received in the hospital and they wanted to give back to others in need. For Brea and Kevin, she said seeing people come and support the American Red Cross and the Joel Memorial Blood Drive is amazing. For more information about CDG, visit www.cdgcare.com/what-is-cdg. To learn more about Joel’s story, visit www.youtube.com/watch?v=x6t2HWoy6s4. According to the American Red Cross, every unit of blood collected goes to a patient in need, and the need for blood is constant and only volunteer donors can fulfill that need for patients. Nationwide, someone needs a unit of blood every two to three seconds and most of us will need blood in our lifetime. Grace Presbyterian Church is located at 360 Hopkins Road. For more information or to make an appointment (though it is not necessary), contact Red Cross Representative Millie at 336-447-8925. 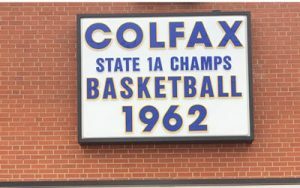 Later this week, a sign is expected to be put on the gymnasium of Colfax Elementary School to pay tribute to Colfax School’s basketball team from 1962 and to serve as a sign noting the location of the town. Nelson, who coached basketball and baseball and taught math and PE at Colfax School from 1958 – 1962, said the basketball team won the 1A State Championship and was one out of roughly 400 1A schools at the time. “In 1963, Northwest Guilford High School and the school were consolidated,” he said, noting that was when Colfax School, which was a K-12 school at the time, became an elementary school. Dottie Little Pyrtle, who graduated from Colfax School and played basketball under Nelson, said when the original Colfax School was standing, there was a sign out for the school, but now with the new school for Colfax Elementary School, the sign is hidden on the side away from the view of commuters. With the idea of putting up a sign on the original gymnasium, Pyrtle got approval and sent emails to people she knew who graduated from Colfax School that she thought might be interested in seeing a sign erected, with the help of Roger Nelson, Ronnie Beeson and Dale Marshall. Pyrtle said they raised $3,202.50 to purchase the sign and expect that it will be erected on the gymnasium sometime this week. The sign will be six feet by eight feet and will be lighted. The colors used for the sign are the school colors prior to 1963 (blue and gold). “We have also contacted the North Carolina Department of Transportation to ask if they could replace the small roadside sign that used to identify our Colfax community,” she said. Nelson and Pyrtle shared some of the history of Colfax. Nelson noted that prior to the 1800s, Colfax was known as Dover Community and settled by the Quakers. “It was later named after Schuyler Colfax, who was the vice president with President Ulysses S. Grant,” Nelson said. Pyrtle noted that Colfax is listed on the National History of Historic Places, where it states that around 1790, Col. Isaac Beeson, a Quaker by faith, built a home in the area which is now Rt 1, Box 770, Colfax, North Carolina. Word passed down through generations states that the bricks used in the construction were made in the area along the riverbank near the house. 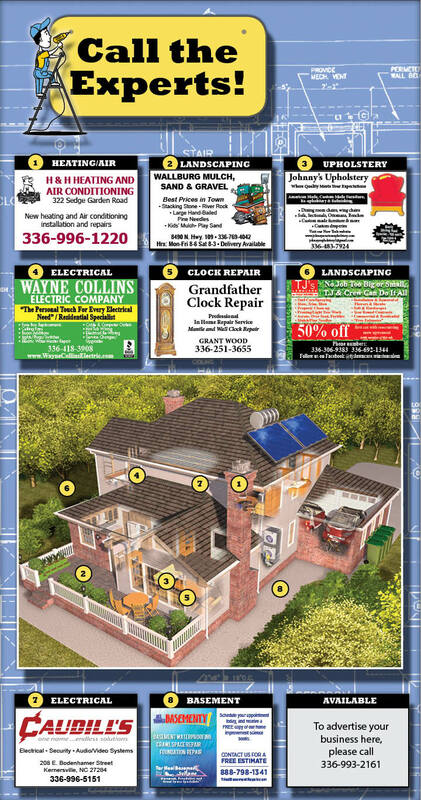 The home and property is owned by Fred B. Bame. On April 16, 1791, George Washington, on his southern tour, toured NC. It is documented he visited Salisbury and Salem (now Winston-Salem). From Salem, he traveled to the courthouse in Guilford County. On the way to the courthouse on June 2, 1791, he stopped and drank water from a spring on the Carl Beeson Farm behind Colfax School. It is also said that during that same trip, Mr. Washington travelled along and across what is now Marshall Smith Road in Colfax. After the 1790 census, and according to the first four deed books of Guilford County, 85.7% of signatures indicated the citizens had the ability to read and write. This was the highest literacy rate of any county studied. The Dover Friends Church was located on North Bunker Hill Road in Colfax in the late 1700s. The graveyard still remains. The Colfax Persimmon Festival is held annually on the historic Stafford Farm in Colfax. A huge attraction in Colfax is the Triad Farmers Market. Pyrtle noted that Colfax School, which is no longer standing, was built in 1924, while the gymnasium, which was built in 1955, still stands and is used by the elementary school. “Today, the population is approximately 4,000,” Pyrtle said. “Colfax has a rich and lustrous history and we would hate for that to be lost,” Nelson added. Another way Pyrtle said Colfax is losing its identity is through mispronunciation, which she aims to correct. Nelson said his father, Harvey Nelson, was born in 1900 and pronounced the town as it is known by locals. Nestled in a dense woodland forest in Belews Creek, artist Jeremiah Miller feels right at home among the focus of his paintings. 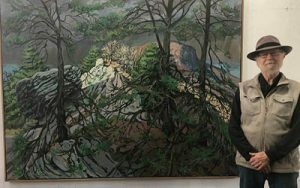 Though many of his paintings feature trees like those seen around his home, Miller often enjoys painting scenes from Hanging Rock and the different rock formations that surround the area, as well as other scenic areas. While he enjoys painting mother nature, that hasn’t always been Miller’s focus. Miller grew up in East Winston’s City View area and graduated from East Forsyth High School with the first graduating class. Having enjoyed art since he was a baby, even stealing his mother’s lipstick to draw a mural on the baseboards, he attended the Ringling College of Art & Design, where he received a Bachelor of Fine Arts (BFA) and later a BFA and Master of Fine Arts from the University of North Carolina at Greensboro. He also served four years in the Navy as a photographer. After Miller received his master’s, he went back to Key West, having been sent there while serving in the Navy, and focused his art on his surroundings. “I got my start down there,” he said, noting that he mostly drew people at that time. Drawing him back to nature, Miller got the chance to get into the NC Visiting Artist Program as Artist-in-Residence at Blue Ridge Community College in Flat Rock, NC and at Wilkes Community College in Wilkesboro, NC, as well as Artist-in-Residence in Camden, SC. Miller shared that it was while he was living in the Blue Ridge Mountains that his interest in painting figures moved to painting nature. “I realized not having a model sitting for me was liberating,” he said, adding that he painted his first mural landscape for the YMCA in 1981 in Hendersonville. Because it was painted on the walls of the YMCA’s pool, he had to use epoxy paint and could only paint for about two hours at a time because of the humidity. Miller said he and his wife, Sarah Johnson, a violinist, were married in 1983 and shared the residency in Camden. “We were there for one year. She took a position at the School of the Arts and we moved back to (Belews Creek),” he said. When they moved back, Miller said they settled into the cabin he built, which one could imagine being a romantically unique home with a bedroom loft that could be featured on a Tiny House TV show. Now, instead of having the log cabin as his studio, Miller had to build a new one on the property, one that he has since added on to eight times. “I started with an 8 x 16 foot building to store my tools, then I built a painting room…,” he said. “The law came down from on high to build a house,” he chuckled. Walking from his larger custom-built home to the log cabin and then over to the sectionally crafted studio, sipping on a miniature cup of espresso, Miller showed me his various rooms filled with wood framed art. While there were what seemed like hundreds of both miniature paintings with equally larger ones, Miller said he averages about 40 – 48 paintings and 35 hours a week, painting about 50 large paintings a year, and 300 – 500 of the smaller ones a year. For the small paintings, he uses thick paint and paints quickly, usually two to three at a time, while the bigger ones are more detailed. “From a distance, the big paintings invite you in,” he said. Miller explained that his larger paintings look abstract to the eye up close, but from far away are like a window to reality; therefore, when he is painting on a large canvas, he often has to paint a little and then walk back from it to look at it from a different perspective and then walk back up to the painting. Miller said what he likes most about painting is the physical application of the paint, and noted that he uses oil paint, but sometimes will use acrylic for the underpainting. When he finishes a painting, Miller said he feels a sense of confidence. “I have a feeling like I’ve been honest with myself. I’m never completely satisfied but I reach a point when it’s an honest attempt,” he said. To learn more about Miller and see more of his artwork, visit www.jeremiahmiller.com. 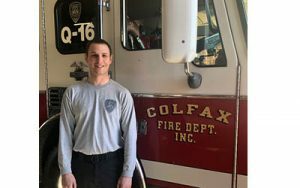 During their Christmas banquet held in December, Firefighter/EMT Ian Macintosh was named as the Rookie of the Year for the Colfax Fire Department (CFD). Macintosh grew up in Greensboro with a family of first responders. He noted that from an early age, he wanted to be a first responder. “When I was in kindergarten, I knew I wanted to be either be a police officer or firefighter,” he said. Macintosh said other than his brother, who used to work at CFD part-time, a majority of his family is in law enforcement. Macintosh explained that he started out in the fire service as a junior firefighter. “It was the 10th anniversary of 9-11 when I applied as a junior firefighter at Summerfield Fire Department when I was 16 years old,” he said, noting that he worked there for three years. Following his time at Summerfield Fire Department, Macintosh worked at Georgetown County Fire Department in S.C. for about a year before coming to CFD, where he has worked part-time for the past two years. Along with being a firefighter, Macintosh also works full-time for Guilford County EMS (emergency medical services). Macintosh shared what he enjoys about being a firefighter. Macintosh said while he enjoys how different everything is, it’s also the hardest part of the job. “The hardest part is probably having to adapt to different circumstances because every call is different,” he stated. As far as working at CFD, Macintosh said it’s the people that make it a great place to work. The most rewarding experience Macintosh said he has had since working at CFD was one that earned him a Rescue Life Saving Award. Macintosh shared that he has also received a Medical Life Saving Award through CFD, and a training award when he was working for Summerfield Fire Department. When Macintosh isn’t helping others, he enjoys playing basketball for fun and working out. He is also currently working on his Bachelors in Emergency and Disaster Management. When he learned that he was being named as the Rookie of the Year, Macintosh said he was surprised. Unlike other departments, the Firefighter and Rookie of the Year awards are based on training hours worked and calls firefighters go on. Looking towards the future, Macintosh said he hopes to be an emergency management coordinator and to continue working at CFD part-time. With the ambition to pursue a career in vocal performance and the music business, Joy Cone competed to appear on the famous singing show “The Voice” in January. 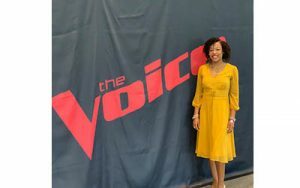 Joy, a sophomore at Walkertown High School, explained that this isn’t the first time she has tried out for “The Voice,” but this is the first time she has made it as far as performing in front of the producers. “They invited me back each year for the past three years to do a private audition,” she said. This year, Joy explained that she did a blind audition through “The Voice” Instablinds on Instagram about three weeks ago, though the auditions have been going on since December. Joy explained that those six people are paired up and the top three contestants, one from each pair, had the chance to perform live in Miami, and for a chance to sing in front of the producers as well. In order to get to Miami, Joy raised funds on GoFundMe and received a lot of donations from her family and friends, as well as the community. Joy’s mom, Alicia, explained that each year, despite the judges liking her voice, she is turned away. “She did really well in front of the producers but they want her to work on a few things,” Alicia said. Joy noted that the experience wasn’t as stressful as she thought it would be. Another obstacle Joy said she has been told is keeping her from moving forward is her backstory. With many of the contestants who make it on the show, they often have obstacles they have faced that Joy said she just hasn’t had to face, such as battling cancer or struggling to survive. Joy said her personal backstory is that she is the only girl out of three very athletic boys, Drew, Madison, and Jalen, in the family. “Growing up, people didn’t really know that my brothers really had a little sister,” she said. Despite being one step from appearing on the show, Joy said she is glad she had the chance to get as far as she did, and plans to continue trying out for various competitions. Like her brothers, Joy plays basketball and uses both her sport and singing as her outlets. At school, she is the vice president of SGA, plays varsity basketball, and is a member of Fellowship of Christian Athletes. Outside of school, she has also played AAU basketball for the past two years. Along with trying out for “The Voice,” Joy has performed during the National Youth Talent Showcase at the National Black Theatre Festival twice, has sung the National Anthem at Dash games, and was invited to sing the National Anthem at the University of Delaware. Joy added that she has been singing since she was two-years-old and performs in choir through school. She also takes voice lessons, sings at church every week, and has performed in talent shows at various camps she has attended. Oak Ridge Town Park recently installed a bench in the dog park in memory of Conner Crossan, who passed away in 2018 after losing his battle with osteosarcoma. According to Cancer.org, osteosarcoma is the most common type of cancer that starts in the bones, and mostly occurs in children and young adults. Casey Crossan, Conner’s mother, explained that Conner was diagnosed with osteosarcoma in April 2016. After seeing that his knee was swollen, and because he was also having flu-like symptoms, Casey said they took Conner to urgent care on their way home. Casey explained that they went to Brenner the next day, where medical staff did some bloodwork to see what type of cancer Conner had. 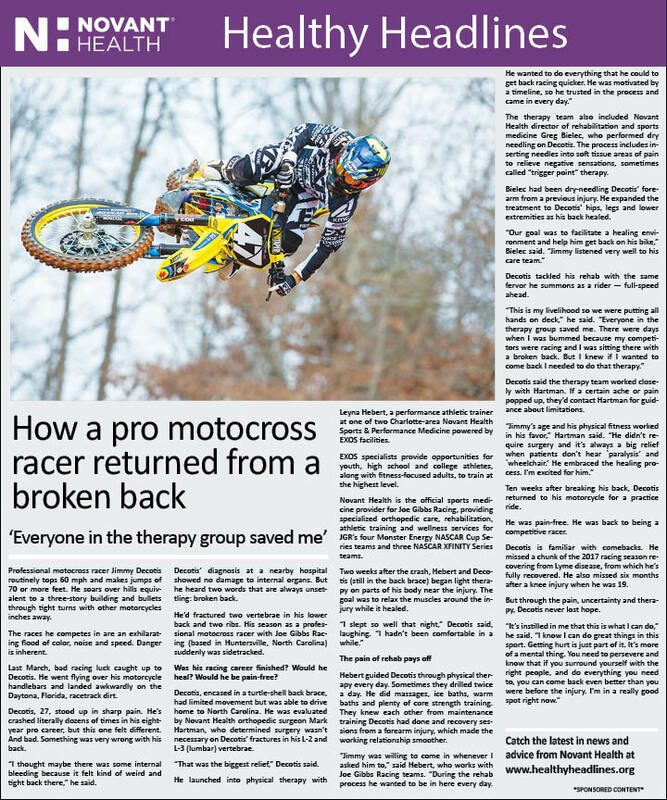 “He was already metastatic (cancer had spread), but he never complained about the pain,” she said. From there, Casey explained that a biopsy was done. Because the blood vessels were wrapped around his tumor, they were told they were going to have to amputate Conner’s right leg. Casey said the first week they went in for Conner’s chemotherapy and a PET scan was done, they learned that Conner had more tumors. Casey explained that once the other tumors were found and it was obvious that Conner had terminal cancer, they decided they were not going to do the amputation. Casey noted that they spent a year at the Cleveland Clinic with doctors that specialized in osteosarcoma, and they lived at the Ronald McDonald House. They also participated in a clinical trial for two months with Dana-Farber/Boston Children’s Hospital. 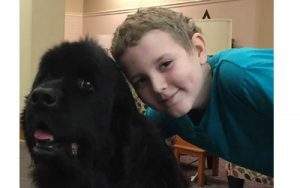 Casey explained that throughout all of Conner’s treatments, no matter where they were, there were therapy dogs. Casey added that even when Creature Teacher came to his school, he would always sign up to see her during the after-school program. When Conner couldn’t be at school, Casey said his teachers got together to have Creature Teacher come to his house and they would always bring different animals. “We adopted a chinchilla while he was sick and now me and him are buds,” she smiled. Casey said they started a blog to keep people informed about Conner’s treatment and Casey and her husband, Bryan, both shaved their heads in September, four months after Conner was diagnosed, to raise money for St. Baldrick’s. “That’s when I really started blogging,” she said. Casey explained that the first chemotherapy treatments were rough; however, after getting anti-nausea medicine, Conner was able to live his life, and that’s what they did for the next two years. Conner had a homebound teacher, having previously attended Oak Ridge Elementary School, and was able to do stuff with his friends when he felt good. “We lived our life while he was sick,” she said. 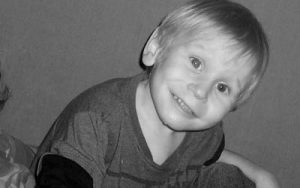 Conner passed away on April 5, 2018, two years after his diagnosis. Since Conner lost his battle to osteosarcoma, Casey has volunteered with the Ronald McDonald House and now is on the Patient Caregiver Advisory Board for Brenner Children’s Hospital. Casey also got involved with MIB Agents, an organization whose mission is to Make It Better for children with osteosarcoma, and with Ruff Love by adopting a dog Conner had picked out a year before he was diagnosed. She has also worked with Shopping4Hope, and more. Casey noted that MIB Agents have direct patient support, give an end of life experience, and fund research. “We (MIB Agents) are the only 501(c)3 that hosts an osteosarcoma conference,” she said. Casey noted that friends also started a GoFundMe page to purchase a bench for the dog park at Oak Ridge Town Park in memory of Conner and his love for dogs. Casey said her goal now is to raise as much awareness about osteosarcoma and childhood cancer. While she is not in any way downplaying adults fighting cancer, Casey noted that since 1980, there have only been six drugs approved for childhood cancer, while there are about 12 drugs approved a year by the FDA for adult cancers. And, while there are, on average, 17 life years lost on an adult cancer patient, there are 71 life years lost on a pediatric or childhood cancer patient. For more information about Conner’s battle, or to make a donation to help children fighting their battle with osteosarcoma, visit www.posthope.org/cars-trucks-trainsand-cancer, www.donorbox.org/conner or www.mibagents.org. The dog park at Oak Ridge Town Park is located at 6231 Lisa Drive, Oak Ridge. 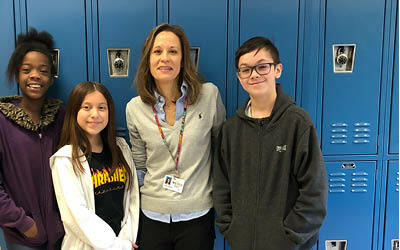 When Susan Andrews learned that she had been nominated as the Teacher of the Year at East Forsyth Middle School (EFMS), she was humbled and inspired. Andrews grew up in Kernersville and graduated from Glenn High School in 1987. After high school, she attended Edinboro University in Pennsylvania, where she earned her second social studies certification for grades 6 – 12 in 1992. Following earning her degree, Andrews found her first position teaching at Dobyns Bennett High School, where she worked for four to five years before moving back to NC with her husband, Philip, and two sons, Gavin and Gray. Having taken time off to stay home with her children, Andrews later returned to teach in 2013 at EFMS, where she currently teaches Ancient World History to sixth graders. Andrews explained that she chose to become a teacher because she enjoys history. “I have always enjoyed school. I love history, and I love finding ways to make history fun and relevant to today,” she shared. Andrews said she enjoys seeing what students want to learn about. “I let students learn about something on their own first, and then we come together to discuss what they have learned and any questions they might have,” she explained. Andrews said the lightbulb moments are among her favorite things about teaching. Andrews said one of the things she enjoys is doing meditation with the students as they get into learning about Buddhism. One of the things that Andrews said she enjoys each year is having eighth graders who she had in sixth grade come back to talk to her and tell her how much they learned. “These kids come to us with little to no social studies, and I want them to leave enjoying social studies and realizing how much they learned and to think of the conversations they can have because of all the things they have learned,” she shared. Along with teaching students in the classroom, Andrews is also active with the school’s Running Club and has helped coach cross country. Outside of teaching, she is an avid runner and enjoys spending time with her family, cooking and having dinner as a family. She noted that she usually does a marathon every other year. When Andrews learned that she had been named Teacher of the Year at EFMS, she said she was humbled. Copyright © 2017 The Kernersville News.